Granite countertops are becoming more popular with homeowners, both for their timeless appeal and elegant look and for their rugged durability and strength. Granite is heat-resistant, almost impossible to scratch and a natural product with a timeless appeal. Granite is the ideal choice for kitchen countertops, cabin flooring, vanity tops and fireplace surrounds since it is durable yet sensuous; a solid, classic look that is functional and appealing. 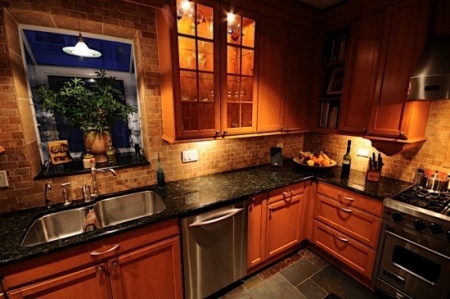 Granite countertops are the ultimate “green” building material. They’re an eco-friendly way to build and will last a lifetime. It is the ideal complement to the rustic look of a log cabin. Kitchens have become the focal point of daily home life and homeowners want a unique and distinctive style for their cabin kitchen countertops. Granite countertops have a luxuriant, polished sheen and a smooth, natural beauty that is evocative of a rich timelessness. It will anchor your kitchen and create a home with warmth and understated elegance. Granite is a natural product with its own unique color and vein pattern. No two slabs are alike and you can rest assured that your custom granite countertop or bathroom vanity is not duplicated anywhere. Caring for your granite is a simple, straight-forward process involving two steps: short term care and long term care. Following these two steps will ensure that you keep your granite looking like new and protected from stains and damage. The short term care for your granite countertops consists of nothing more than a daily wiping and cleaning. This is no more than you would do with any countertop. The only difference is that you need to be careful what kind of cleaner that you use. Many cleaners are too acidic and can damage the sealant that is applied to granite. This can allow the chemicals to seep into the pores of the granite and may cause discoloration. While it is possible to remove stains from granite, it’s far easier to select non-acidic cleaners from the supermarket for your daily cleaning. A good daily cleaner is Formula 409 Natural Stone Cleaner. Warning: There is an acid that will severely dull, etch and pit a polished granite countertop surface. This acid is called Hydrofluoric acid (HF) and is found in many rust removers. Be sure and check labels to make certain you don’t use anything containing Hydrofluoric acid or you may permanently damage your granite countertop. The long term care for your granite is as simple as re-applying a sealant to your counter top to help seal the pores. It needs to be done maybe two times a year and is very easy. 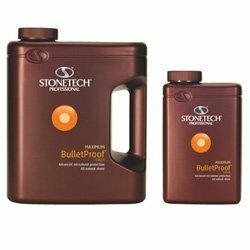 One such sealant is StoneTech BulletProof Stone Sealer. For a cheaper alternative you can simply use regular car wax. This is an effective sealant for your granite countertops and is as easy as waxing your car. 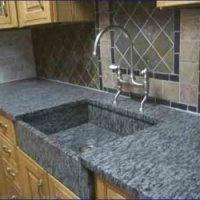 Granite is a porous material and unless you keep it thoroughly sealed it can get stained. In order to remove the stain you must pull it out of the stone with a poultice. Mix these ingredients together and apply directly to the stain, only slightly overlapping onto the unstained granite surface. Apply the paste about ¼” – ½” thick, cover it with plastic wrap and tape it to the granite countertop to seal it. Let it sit for 24 hours, remove, wipe with a damp cloth and let dry. If the stain persists you may need to repeat this several times. If this doesn’t work you can try using high-potency Hydrogen Peroxide at 30 – 40 volume, not the typical hydrogen peroxide at the pharmacy which is 3.5 volume. Try asking at a beauty salon for "liquid developer", which is cosmetics grade hydrogen peroxide. 30 volume is 9% hydrogen peroxide and 40 volume is 12% hydrogen peroxide.